February is Heart Thread Month! Whichever thread types, colours, and flavours your heart desires...are 14% OFF! If you already know the THREADS YOU LOVE & DESIRE click All Categories. 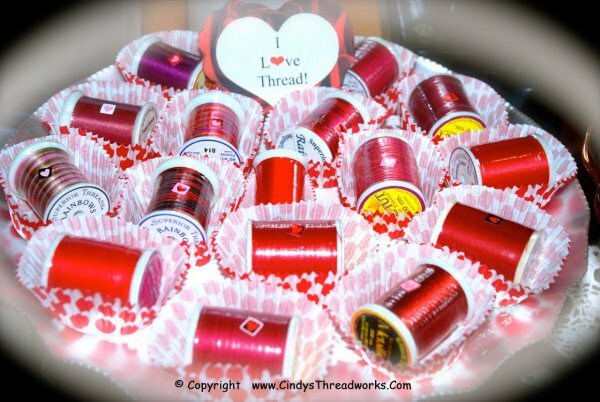 Not sure which thread types are best suited for quilting? for piecing? for machine embroidery? for fine detail? for bag projects? for bobbins? for hand quilting? for hand embroidery? for appliqué? for metallic embellishment? for silk ribbon embroidery? new thread items? until midnight Sunday, Feb. 17th! Shop in-Person at Cindy’s Threadworks Booths at these 4 Spring Events! April 12th & 13th, Fri/Sat. Link to our website to view THREADNEWS on Newsletter Page. Watch for THREADNEWS! Extra Newsletter later this month. Happy Quilting & Stitching with Delicious Threads! !